Roses are red. And pink. And white. And cream. And peach. And purple. And yellow. The return of spring also signals the beginning of the wedding season. What better way to treat yourself to some fragrant wedding inspiration than taking a walk down your local flower market? It's there that you can talk to floral suppliers about which blooms will be in season for your wedding. For any DIY-ers, you can head straight to the source to pick up a few blooms for your many special occasions such as your bridal showers or future dinner parties. Myself? I just like getting lost in the irresistible loveliness of all the flowers so close together. It makes me want to take them all home with me! Image via we heart it. This photo is fantastic! Happy spring to you. It is my hobby to visit flower market at every morning becoz it like the most. 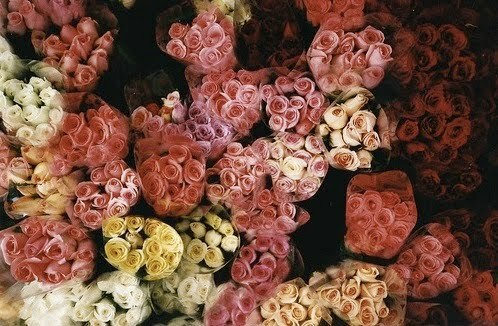 Flower markets have a great variety of flowers! Really,if you do have crafty hands,you can create gorgeous arrangements yourself! Thank you for the post!